This piece came about quite by accident, although the components did not. It was only after starting to work on my first loomed beadwork piece and wondering what I would do with it that I came up with the ideas for composing a piece specifically for this show. The moose hide came from my worn out 15 year old Steger Mukluks that finally sprung a leak two winters ago. They cannot be re-soled, and I tried in vain this past winter to use Shoe Goo, to no avail. It was time for them to go in the trash. Before I sent them there though, I cut away the leg portion. No sense in wasting good moose hide. I used the moose hide as a base for the bracelet, and the necklace. 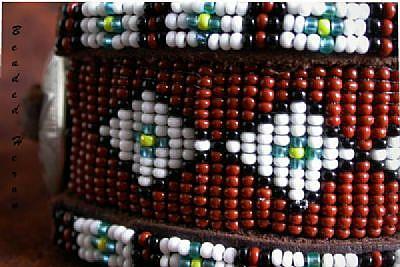 I used the mukluk laces as the border of the necklace and bracelet after I embroidered them. I sewed them and the loomed beadwork to the moose hide rectangles painstakingly through each row. Velcro from a decade old previously constructed purse was used as a closure for the bracelet.. The quills I incorporated in the earrings came from a porcupine that happened to cross a dark lonely two lane blacktop country road one dark night 25 or 30 years ago, as I was coming along and accidentally hit him. I stopped and could see his shadow from my brake lights that he was still moving. I didn't want him to suffer, so I did the only thing I could and I drove over him again to put him out of his misery. Then I got out of the car and picked up the quills that had spread across the dark road using my headlights for light, all the while apologizing with tears in my eyes and thanking him for the quills. No sense in letting perfectly good quills go to waste! It never dawned on my until I was working on this jewelry set that hitting that porcupine is what actually started me beading all those years ago because I wanted to make earrings from the quills. The earring bead caps and wires were from the first two pairs of earrings I ever made, shortly after running over the porcupine. I made the two pairs but now only had one earring of each pair. I was never able to dispose of them, for they remind me of my humble beginnings into the world of beads. It was time to recycle the caps and wires now for this special set. I didn't have to destroy those first earrings, however. I was able to just cut away the metal loops. Now the earrings can go back into their drawer where they can forever remind me of where I started. The hair on the necklace concho comes from three sources - my dearly departed horse Bucko, the love of my life, Sar's Amira, my beautiful Arabian mare, and a lock of my own. The three of us shall remain together for all time according to Ojibwa culture. I have kept both horse's tails and mane hairs together along with my own hair since the passing of my beloved steeds. 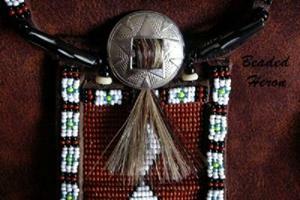 I have also sewn some of Bucko’s and Sar's Amira’s and my hair inside the necklace beadwork. 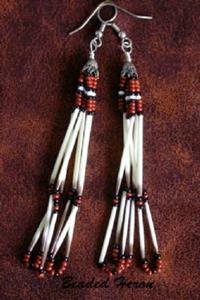 I also added a few bone beads from an old bone choker that I took apart for this work. 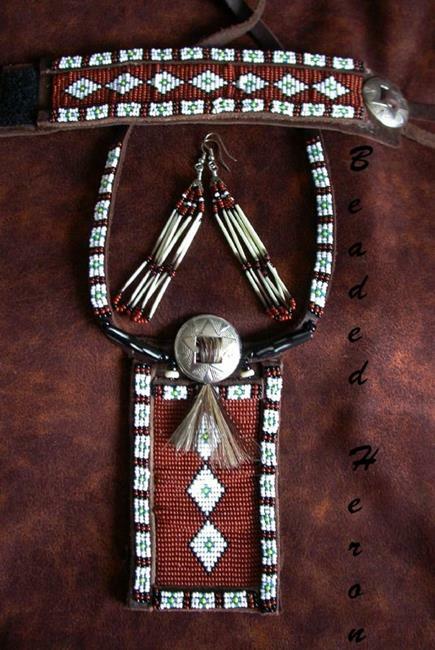 The only new material I used in these pieces are the seed beads I decorated them with. This set is my amulet. All parts either separately or together are things that have been with me everywhere I have been for the past quarter century and more. There is significance all the way through it's creation as I did everything in threes. Three rows of beadwork, three diamonds on the pendant, Bucko’s and Sar's Amira’s and my hair, and my beloved summer and winter moccasins that took me on many a journey and one poor unfortunate porcupine that met its fate on that dark lonely road so long ago.